[Featured Image Description: Book cover for ‘Frida Khalo: Little People, Big Dreams.’ The rest of the images in this post are book covers from the preceding text]. This is the fourth of a four-part series: In this post, you’ll find stories featuring disabled heroes throughout history, learn about the fight for disability rights, and discover how to recognize ableism in biographies written for children. If you are about this topic, I’m assuming you’re already familiar with the disability rights movement and are looking for real-life disabled role models through history to read with your kids. So I’ll spare you an explanation of the social model of disability and our long history of child abuse, eugenics, and the murder of disabled people up to the ways we discriminate against disabled people today.. Teaching kids that disabled people have fought for recognition and human rights throughout the history of humanity helps them understand that disability does not render us incompetent or irrelevant. Fighting the erasure of marginalized groups fosters a compassionate, more inclusive society – but also shows them how far we have left to go. One thing we should note here is that children’s books, especially those written for the under-8-crowd, are never historically accurate. The purpose of books for this age group is to inspire curiosity, compassion, and an impulse to grab the torch. Here’s why this is okay: These dudes still eat their own boogers. A 3-year-old is not ready for nuance and gray areas. I use these stories inspire my boys to keep learning – to dig deeper and ask questions, to talk about role models with friends, and find solace and courage in the people who cleared a path for them to follow. But these books are not perfect, and they should not be read word-for-word. The following books are rife with historical error and hyperbole, sanitized and white-washed. Reading and discussing them requires you work. Until makers create stories that expose inequity while remaining engaging, it’s on us grown-ups reading aloud to recognize the whitewashing inherent in these stories and call it to the surface so our kids learn to identify it, critique it, and fight against it. I try hard not to skew book lists white and male – but I can’t review books that don’t exist. We need more stories on disabled people of color, disabled women, trans and non-binary folks, etc. These people exist in droves – the problem is that no publisher wants to boost them. Beyond that – we need more books normalizing disabled characters. Because everybody is worthy of respect, safety, shelter, and dignity, whether they’re savants, tragically average, or face profound daily challenges. Disabled heroes from a range of backgrounds and intersecting identities. At least a few life details beyond their identity as an outsider. A clear stance against forced labor, unwilling institutionalization, forced sterilization, abuse, murder, etc. Calls to action for readers to continue fighting for equity and inclusion. Respectful, inclusive language that has been vetted by #ActuallyDisabled adults. Inclusive accessibility. If you’re writing about (and profiting from) the experience of a blind person – create a braille edition. We’ve read like 20 picture books on Tubman, and no author is willing to portray this powerful hero in US history as disabled – but she was. This story comes closest to addressing her disability, but never quite gets there. Either way, our kids should be aware that one of the fore-mothers of equality and civil rights was disabled – and she was competent and capable. Heads up: briefly reference her ‘attack’ at a young age (no details, but this was our intro to child assault). Check out Read Families of Color Monterey County’s spectacular review outlining the whitewashing in this book. Read it with these criticisms in mind so you can learn what to look out for in similar stories. Caveat: Keller was a eugenicist, and this book contains insufficient (and erroneous) braille. Despite all this – it’s still an amazing book that makes me happy-cry. This book was published in tandem with Amy’s supreme court fight for inclusive school accommodations, which they lost, but set the path for later legislation like the IDEA– although you wouldn’t know Rowley was a hardworking advocate for inclusive education based on the story – she’s just a regular kid in the book. is the single best book I’ve ever read both normalizing and educating a real-life girl balancing everyday kid stuff with typical accommodations for living in a primarily Deaf family. What an AWESOME example for our own kids, to see children just like them are capable of working toward inclusion and equity. Carefully screen this for sensitive kids and kids under 6. Mentions murder of family, has some scary illustrations of a snake-headed monstrous character. But it’s a WONDERFUL book if you can get past that. Deganawida partnered with the gifted speaker, Hiawatha to form alliances between the five (and later six) nations now known as Iroquois Nation. Together, they founded a peaceful government based in restorative justice, peace, collective action, and forgiveness – a modern government still in place today. The US government drafted major portions of our constitution based on the democratic principles created by Iroquois Nation. Okay – so this isn’t a children’s book, but it IS an amazing depiction of the section 504 sit-ins in the fight for disability rights. The reason I include it here is because Drunk history does this WONDERFULLY – featuring disabled actors, centering disabled heroes, and consulting and listening to feedback from activists within the disability rights movement. 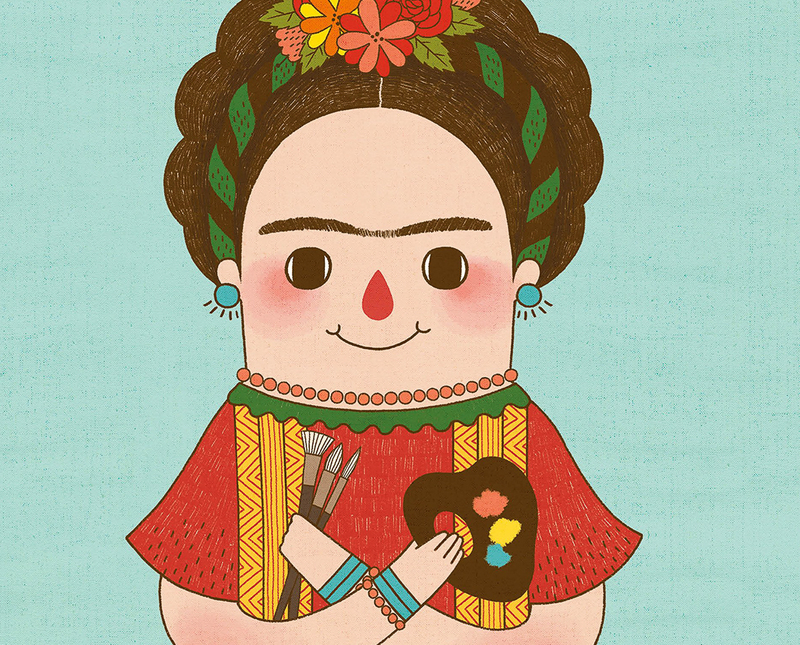 Kahlo is the hot new disabled woman of color who everyone wants to write about lately. This is the most engaging book we’ve found on her. ‘Black Disabled Art History’ – Compiled by Leroy F. Moore, Jr. This text book is too advanced to screen with my Littles, but it was created by a black disability rights activist and artist to address the lack of visible role models for black disabled children. Because publishers weren’t interested in Moore’s book, he had to publish it on his own and it reads that way. It’s a textbook, not a story (not something we typically cover at BFL), but it demonstrates the need for more books on disabled artists of color. This chapter book is a bit above our Little’s heads, but I enjoyed it and it gives us some insight into the intersection of how race, wealth, and citizenship status affects disabled kids and teens. The kids loved this not only for the example of working hard to get over obstacles, but for the presumption of competence Emmanuel’s mother maintained throughout his childhood – and the difference her mindset made. This story showed us how players with disabilities can inspire league-wide disability accommodations that help every player. Grandin is a controversial figure. As wealthy white woman raised in the 50’s, she says terrible things about those of us who aren’t her type of speaking, savant autistic, and has failed to acknowledge that autistics who don’t have her skills and resources deserve equal rights. Since she’s the only openly-autistic woman given a voice in the mainstream media, this is a problem. But this book is still amazing and perfect for littles. The writing falls apart in this (it’s kinda a song – but kinda not?) The visuals are jazzy and stylish, but I’ll admit it’s not an engaging read unless kids already know and like Stevie Wonder. This is gorgeously written, but completely over my 5 year-old’s head. Social media etiquette tip: Follow, don’t friend. Do not expect to be personally educated, and offer payment if you’re gonna poke them with questions, ask them to speak, or spend time on you. Vilissa Thompson of Ramp Your Voice! Support them on patreon here. Click here for more BFL books fighting for disability rights. Books for Littles runs on coffee and my autistic hyper-focus interest in raising lumianries. Consider boosting the voice the work of my autistic brain on Patreon, so we can continue to help parents & educators like you raise the next generation of kind & brilliant leaders. For as little as $1 a month, you can make BFL accessible for families everywhere and get access to exclusive bonus content that you can’t find anywhere else.